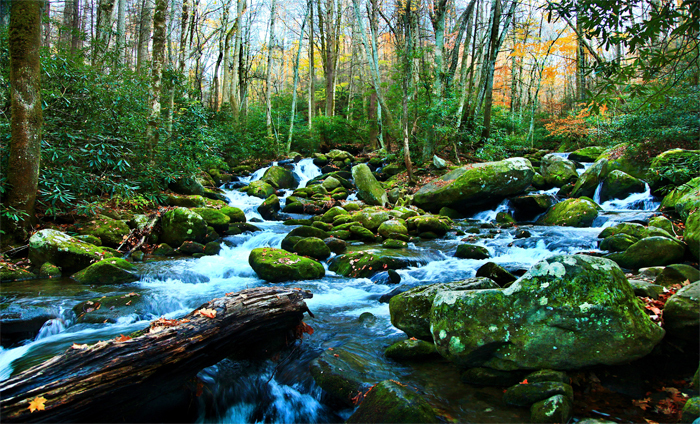 The Great Smoky Mountains National Park is a beautiful place any time of the year, but no more than in the fall. The green in this photo masks the fact that it was taken in the final days of October 2010. Beautiful green mossy river rocks cover the riverbed in this vibrantly green photograph. I actually had found this location by chance. Rose and I were on a four day trip to Gatlinburg, Tennessee and after a hike on the Grotto Falls trail, we began to head back to our hotel about an hour before sunset. As we drove along the Roaring Fork road leading out of the Grotto Falls area, we passed several historic buildings that date back to the early 1800s. The colors of the leaves changed as we drove along the road and what was once a vibrantly red and yellow scene around us was now turning back to green. I noticed that we were driving alongside a large ravine. From the car, we couldn’t see very much. I pulled the car over and went to explore. As I got to the bottom of the ravine, this is what I saw. I must have stopped at just the right spot to have found such a perfect photo opportunity. Just before taking this photo, I found another stream that was surrounded by a vibrant variety of autumn colors and made for one of the best fall photos in the Smoky Mountains National Park that I took on the entire trip. Printing this photo for public use or display without prior written consent is strictly prohibited. For information about the use and licensing of this photo, please refer to the Creative Commons license and copyright disclosure in the paragraph below. Newspapers, magazines and all other publications wishing to publish this photo can refer to my licensing terms and agreement or can contact me directly for any requests and inquiries not covered in my licensing terms. Smoky Mountains Mossy Brook by Joey B. Lax-Salinas is licensed under a Creative Commons Attribution-NonCommercial-NoDerivs 3.0 Unported License. Permissions beyond the scope of this license may be available at http://www.joeyblsphotography.com. JoeyBLS Photography is proud to be your Northwest Indiana photographer serving all of Chicago and Northwest Indiana including the communities of Burns Harbor, Cedar Lake, Chesterton, Crown Point, Dyer, Griffith, Hammond, Highland, Hobart, Lowell, Merrillville, Michigan City, Munster, Portage, Saint John, Schererville, Valparaiso, Whiting and Winfield. Type in a KEYWORD to find a photo!